A Little Chaos, Alan Rickman’s belated directorial follow-up to The Winter Guest, imagines a romance between a real historical figure—the famed French landscape designer André Le Notre—and an entirely fictitious colleague. Opening text cheekily acknowledges the fabricated nature of the story, noting that its veracity doesn’t extend much past the fact that, yes, there were gardens at Versailles. This raises a nagging, inconvenient question: If Rickman, who co-wrote the film with Alison Deegan and Jeremy Brock, was beholden to no historical record, why didn’t he come up with something more interesting than another tale of tentative courtship in the time of corsets? 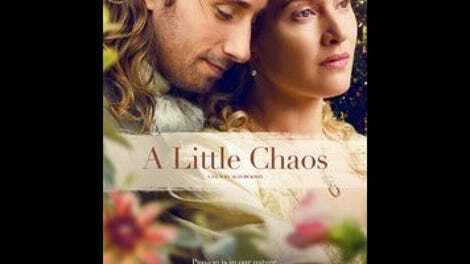 Watching A Little Chaos, one might assume that its makers were dramatically limited by the details of Le Notre’s life, when it was really just their own imaginations do the limiting. Set in 17th-century Paris, where everyone speaks English in an English accent (save for a German duchess who speaks English with a German accent), the film commences with King Louis XIV (Rickman) commissioning an extravagant series of gardens for his palace. Because the task is too mighty for one man, even one of great brilliance and renown, Le Notre (Bullhead’s Matthias Schoenaerts) acquires the services of an unlikely new collaborator: Sabine De Barra (Kate Winslet), a French commoner whose green thumb helps her overcome gender and class bias to score the plum position. Tongues cluck and noses go up as this nobody becomes a somebody in the royal court. Le Notre, meanwhile, finds himself drawn not just to Sabine’s discerning eye, but also to her beauty and directness. Between all the cautious fostering of affections, it’s a wonder that these two “clay kickers” have any time for their big project, the building of the gardens stone by stone, fountain by fountain. Not that this film about landscape designers gives two shits about landscape design: The taming of Versailles’ vast and verdant acres is depicted through a few vague montages, Sabine and her employer consulting some briefly glimpsed diagrams while talking shop. Here, gardening is more of a metaphor for relationships, and the characters don’t miss a single opportunity to directly compare themselves to greenery. “Like a good plant, I submit,” Le Notre tells his new co-worker, who later echoes the sentiment by confirming her need to adapt, “like a well-trained plant.” In case the point hasn’t landed, Winslet also delivers the floral equivalent of that celebrated porch speech from Sideways, in this case instructing the king on the importance of warmth and attentiveness while nurturing a rose. To put it in the film’s own terms, subtext is a weed that Rickman just can’t stop himself from yanking. When he does cool it with the double-meaning garden gab, a poignant moment—like Louis The Great fondly remembering his dead queen, even as he acknowledges how arranged their marriage was—sometimes manages to bloom. But Rickman the director is less subtle than Rickman the actor, and he often drowns the sentiment in the torrential downpour of Peter Gregson’s bombastic score. (There are times when it feels like we’re watching an extended trailer for the movie, what with the endless music and montage.) For all the coded talk of blueprints, what A Little Chaos really hurts for is, well, a little chaos. It has the rigid dimensions of a bad biopic, just without much bio.